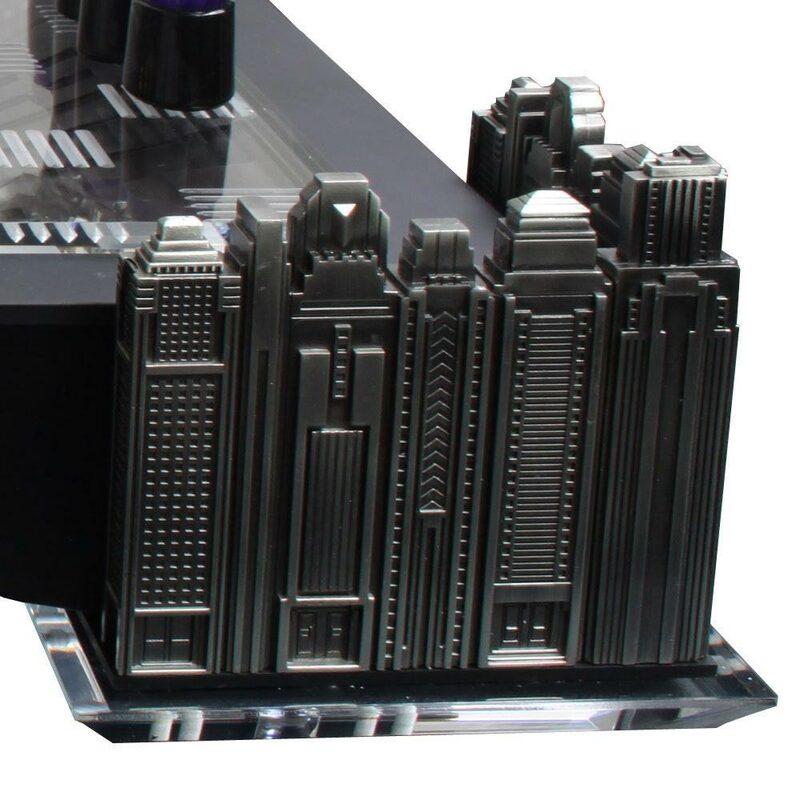 Batman fans who like a good game of chess will find plenty to love about this Warner Bros. Batman Gotham Cityscape Chess Set. This set is amazing and no detail has been overlooked. 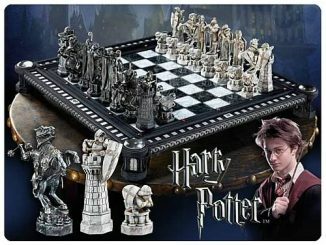 It features pieces made of pewter and die-cast metal that stand on a heavyweight light-up board. 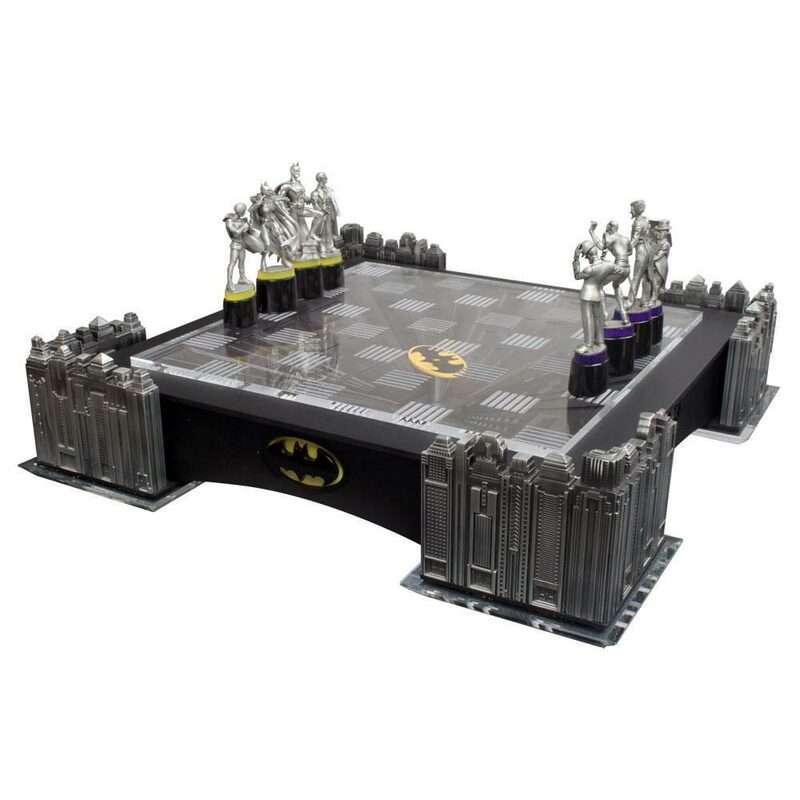 Control your team as Batman, Robin, Batgirl and Commissioner Gordon battle the Joker, Catwoman, Riddler and Penguin on an oversized 20 x 20 inch playing surface. 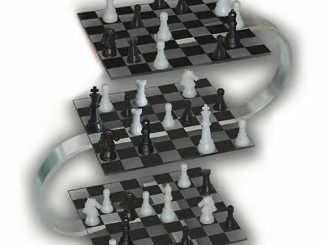 When you press the Batman symbol on the side of the chess set, 50 LED lights circle the playing surface, lighting up the board. 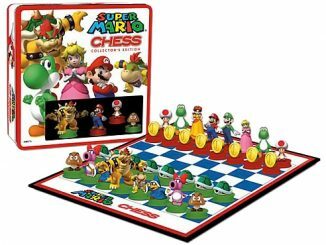 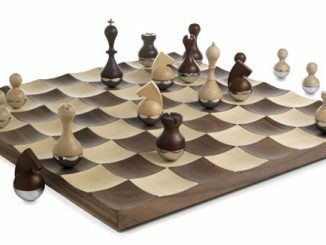 This set weighs nearly 34 pounds and you can display the pieces on the board, or keep them in the black storage box which is included. 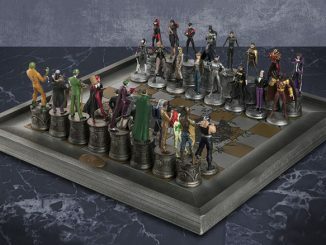 No detail has been overlooked in this ultimate high-end Batman collector’s chess set, which features pieces made of pewter and die-cast metal that stand on a stunning heavyweight light-up board. As your game of chess unfurls, Batman, Robin, Batgirl and Commissioner Gordon battle the Joker, Catwoman, Riddler and Penguin on an oversized 20 x 20 inch playing surface. 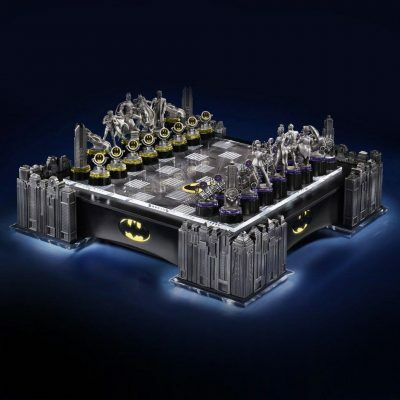 When you press the Batman symbol on the side of the chess set, 50 LED lights circle the playing surface, lighting up the board. 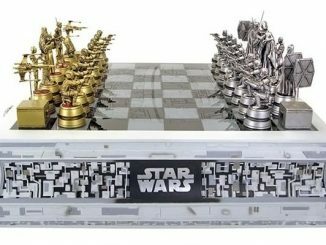 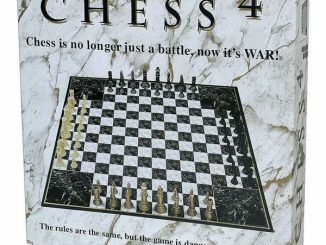 This heavyweight chess set is a stunning tribute to Batman, and will be treasured for generations. 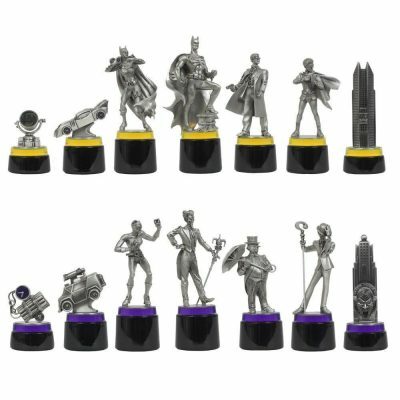 The pewter and die-cast metal pieces range from 2 1/2 to 5 inches tall, and either side can be designated to play as Black or White. 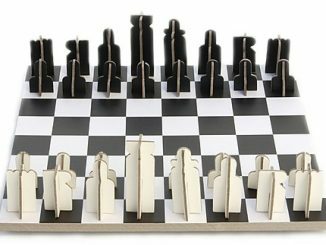 The full set, including the base and the pieces, weighs in at nearly 34 pounds (20+ lbs for the board, 13+ lbs for the pieces). 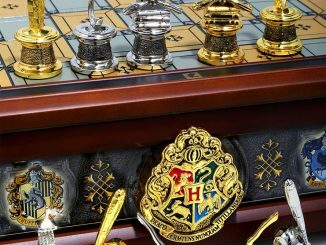 The pieces can be proudly displayed on the board at all times, or kept in the handsome black storage box, which is provided. 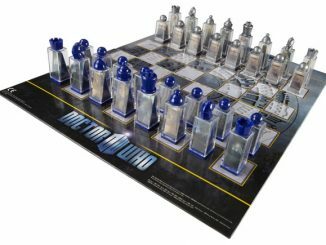 The light-up action is powered by four D batteries, which are not included. This Noble Collection Batman Gotham Cityscape Chess Set is $794.95 (although currently on sale for $100 off) at WBshop.com. 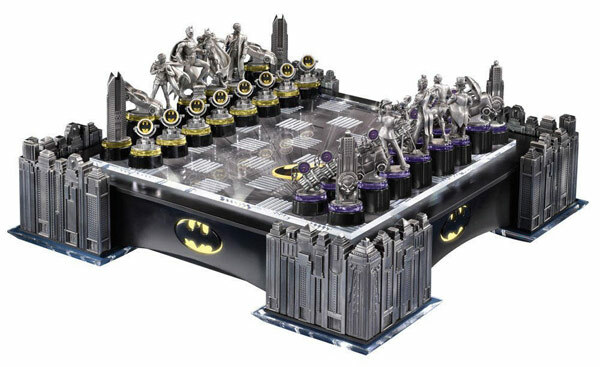 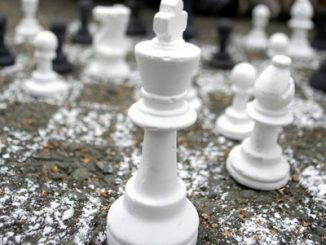 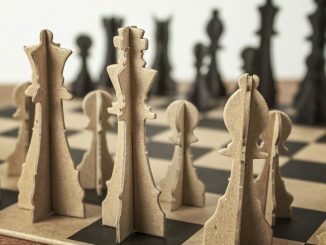 Best Batman chess set ever!